Total brand control - we make it easy for you. to stand apart from the crowd. Your logo here. With us. Your logo is important. Your logo matters. Your logo should be here...with Pinnacle. With over 20 years of expertise in promotional products, branded apparel, and print collateral, we help you do more with your promotional marketing. From budget giveaways to executive gifts, amp up your marketing with promotional products. Coordinate your team, engage your employees, and reinforce your message with branded apparel, from budget to brand-name. 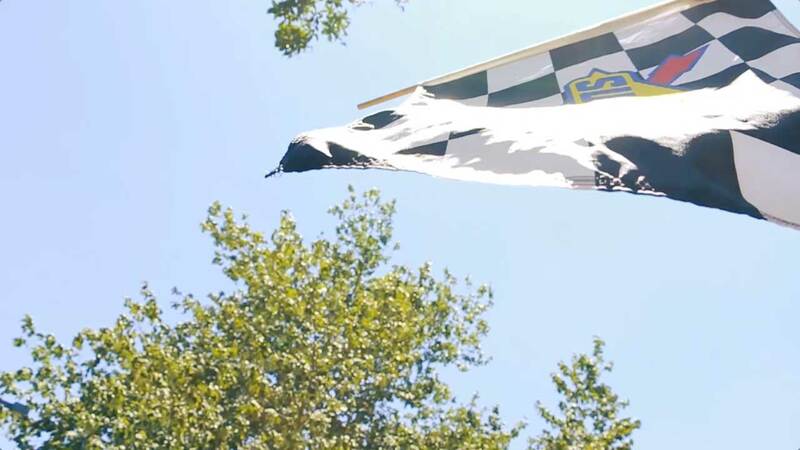 From an office picnic to an enterprise-wide uniform program, we've got you covered. From business cards and pocket folders to event materials and custom name-drop training manuals, our full-service print shop helps keep your marketing more efficient and effective. Products are just the beginning. You can buy your promotional items from 24,000 different companies. It’s what we do with those items that sets us apart. 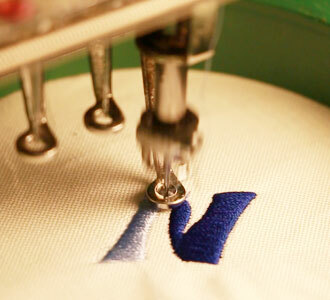 For apparel decoration, we have both embroidery and screen print capabilities located in our fulfillment center. Our embroidery capacity allows us the ability to scale production to meet the demand of our largest programs while keeping overhead costs at a minimum. Multiple 14-station screen printing machines allow us to maintain quality for all of our apparel projects. By leveraging our customizable solution, clients are able to more effectively coordinate purchasing, standardizing it across your entire organization while reducing costs and administrative overhead. 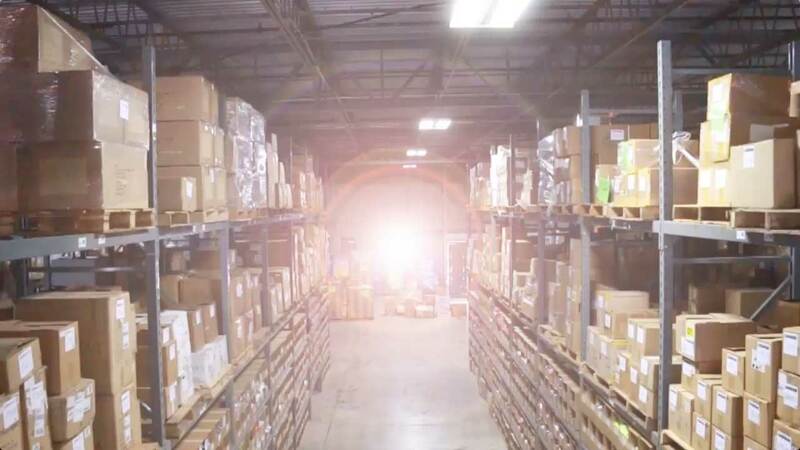 Our 100,000-square-foot warehouse enables us to offer inventory options for our program clients not found with most promotional product distributors. We manage the entire supply chain, from sourcing to warehousing to fulfillment, ensuring products arrive when and where they are expected. 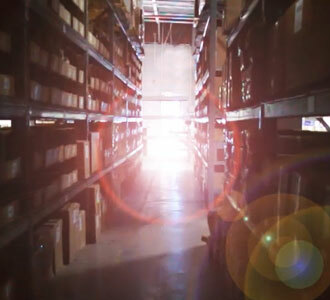 Our 100,000-square-foot distribution center provides pallet and pick location storage for our clients. Our robust inventory management process ensures the highest availability on a wide array of products, while keeping inventory levels and costs at a minimum. We ship orders for inventoried goods within 24 hours of order processing. Items are pulled, barcode scanned, packaged, and shipped according to each order request. We have processed over 10,000 orders in the past 12 months with an accuracy rate of 99.7%. From sales and marketing kits, themed giveaways, gift-with-purchase orders, boxing, bagging, sorting, and kitting, we have the equipment and the skilled warehouse team to handle kitting assembly efficiently and cost-effectively. Our kit and parts assembly services include both on-demand kitting and pre-assembly for the creation of in-house stock items. Pre-assembled kits are inventoried and warehoused, awaiting pick & pack and order processing. Pinnacle strives to provide you with complete transparency and visibility into your promotional products program. 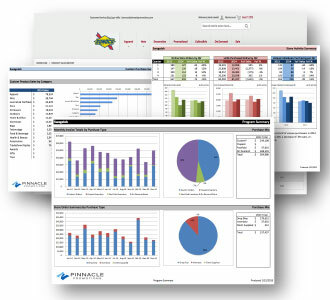 We provide comprehensive monthly, quarterly, and annual reporting across every aspect of your merchandise program to facilitate analysis and insight into your promotional product spend. Additionally, Pinnacle will coordinate a quarterly meeting to review program reporting, project updates, store or program issues and resolution tactics, and any other open items necessary to ensure proper implementation and execution of your overall program. Do More with your promotions. Leverage our 20 years of expertise in promotional solutions to come up with the perfect ways to use promotional products and branded apparel. 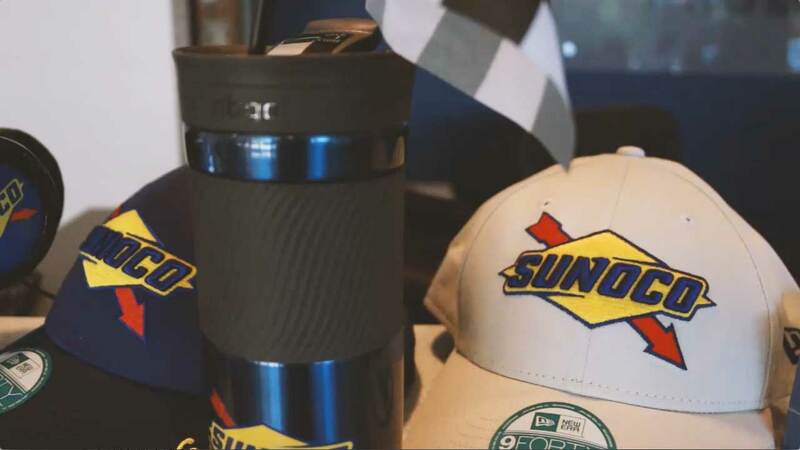 For over 20 years, we’ve helped companies just like yours create custom merchandise, apparel, and event materials to stand out above the crowd. Outfit your team: The first impression is important. Make sure your entire team looks good and on-brand. Build Traffic: Give away something cool and attendees will flock to your booth. It's that simple! Hand out custom bags: Everyone at a trade show needs a bag. Hand out bags with your logo and build brand awareness well beyond your booth. Focus on booth decor: Accentuate your awesome brand with awesome booth decor. Have a show-stopping raffle prize: A premium raffle prize is an excellent lead generating mechanism. How do you make a new employee feel welcome? The first day is a big deal. It doesn’t take a big budget to make someone feel lucky to have joined your team. From purely functional to super fun, we can help you create the perfect onboarding kit. Our teams become an extension of yours. We learn your priorities, understand your objectives, and select merchandise that reinforces your branding strategy and helps you achieve your goals. Distributed teams often run into issues of inconsistency and inefficiency. Centralizing your promotional purchasing with Pinnacle removes those issues and ensures that your brand will be represented properly and effectively. 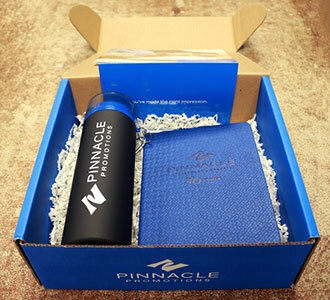 "Pinnacle has set the benchmark for promotional partners." "Pinnacle is large enough to handle our internal and external customer needs while being nimble and creative." 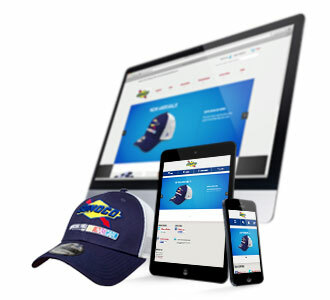 "A company store solution that actually works for our brand!" The world's most recognized brands trust Pinnacle. Let us help you customize your solution. Give us a call at 877.796.3397 or fill out this form. Thank you for contacting us. We will get back to you as soon as possible. If you have an immediate need, feel free to call us at 877.796.3397 . Sorry! Please fill in all required (*) fields! Pinnacle's expertise in brand management, product sourcing, and logistics helps you do more with your promotional marketing. Grow your brand. Improve your procurement processes. Make the right impression™.